I got Norms schematic today so I thought I'd post it. What size coil form do you recommend??? Any coil made for the broadcast band will work. Just add a couple turns for the tickler. I wouldn't remove your 25 turn coil. You might want to use it for antenna and ground input? Won't have a problem if you are familar with regen radios. If not familar will take a few minutes tuning. Suggest using a very low value pot for R1. The type used as speaker fader control in car radios will be ok.
Whats the purpose of the .022 speaker cap in this circuit? the .022 ufd cap by-passes the RF sig to ground ( b+) while the audio sig is passed by the transformer to the next stage. At what voltages should the caps be rated at? Could I use a different coil to receive SW? Since it uses a 12 V supply, 16 V or 25 V caps should be fine. The resistor doesn't dissipate any power so a 1/4 W or 1/2W is fine; whatever you have handy. Yes. You would need fewer turns, of course. You might try about 40 turns with a 6 to 6 turn tickler coil. Experiment! That's where the fun comes in! Sorry, I meant to write "6 to 8 " turns for the tickler winding. 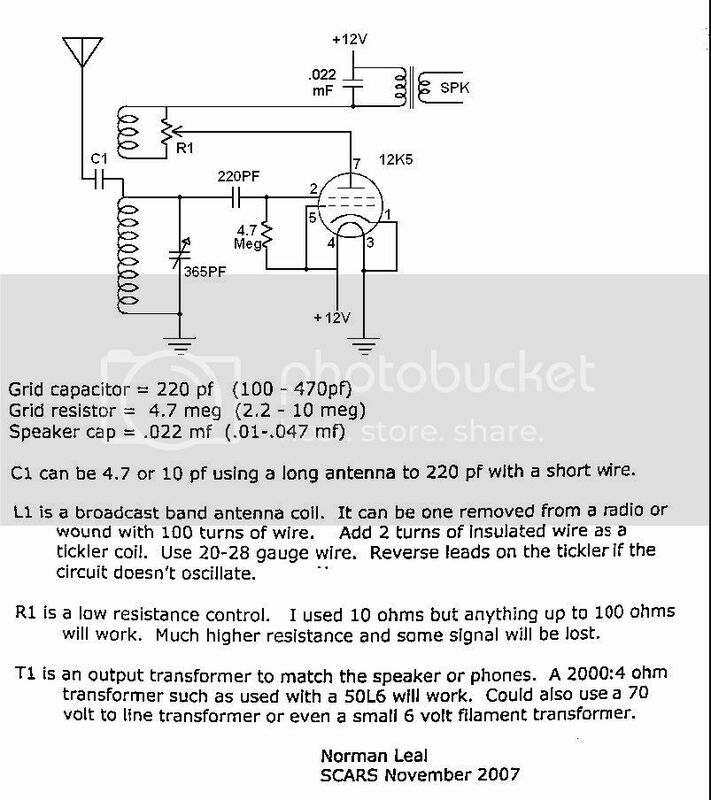 I would like to build this radio using a variable tickler instead of the reostat. 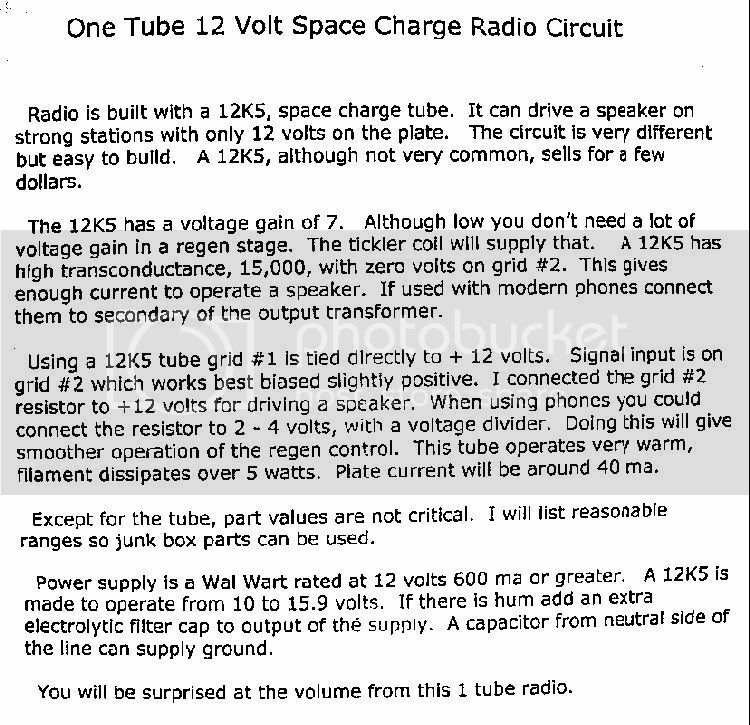 I am having trouble finding a 12K5 tube though. It seems to be a bit scarce. I got mine off of ebay, Probably paid too much but oh well. There were like 4-5 on there the other day. The one I bought was $10 incl. shipping. I went to Tubes And More and they didn't have them so I immediately turned to ebay, Forgot about Radio Daze.....DOH! On another note I was thinking of making both BC and SW coils complete with their own ticklers for this, and then wiring them in so I can just flip a switch/s depending on which band I want. Based on Rich's earlier post I should be able to do this w/ o mods to the rest of the circuit right? Do you wind the tickler around the broadcast coil or above? The tickler/feedback winding can be separated from the main coil by about 1/8" if you're winding it on a standard plug-in coil form. In practice, it can be wound right around the main coil... Although 6-8 turns will suffice, anything in the area of 10-45 turns will work as the setting of the regen control will control the feedback. Like mentioned tickler can be wound close to the tuning coil. With this tube tickler only needs a turn or two. I wrote two turns but found even 1 was enough when I built the circuit. Could I use the audio transformer from my junk Westinghouse WR-179(5 tube AMer)? It looks the same as the one pictured but I don't know the specs. Last edited by 35Z5 on Apr Mon 18, 2011 7:33 pm, edited 1 time in total.